After multiple incidents of gun violence in Orlando, the country awaited a decision in the Senate regarding gun control legislation. 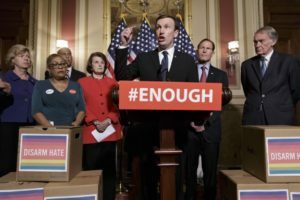 Intended to prevent terror suspects from being able to purchase a gun, and allowing for further investigation by the federal government in order to appropriately permit or deny the sale of a gun, the proposed legislation would address an issue that surfaced after the shooting at Pulse nightclub in Orlando. The gunman who opened fire at a gay bar last month was able to purchase the weapon used to kill 49 people despite having previously been on a federal list of terror suspects. Perhaps, with legislation preventing individuals suspected of involvement in terrorism, such violent acts- and subsequent tragedies- could be avoided in the future. Though the Senate’s decision to reject these measures against gun violence was not surprising given the historic lack of bipartisan support of stricter gun control legislation, it is disappointing to say the least in light of the deaths of innocent civilians, the hate crime that transpired, and the terrorism inflicted which could’ve been preventable with the right laws. What is surprising is the disconnect between the U.S.’s reaction in policy to tragedy, and that of other nations around the world. According to the Council on Foreign Relations, after a school shooting in Montreal in 1989, Canada took dramatic measures in passing the 1995 Firearms Act to reduce gun violence. Canada, as well as several other nations, experiences significantly fewer deaths due to gun violence than the United States. Australia reacted similarly after a massacre that left 35 dead in 1996 with the near prohibition of automatic and semiautomatic rifles, stricter ownership and license laws, and a reduction in firearms in public circulation with the implementation of a gun buyback program. The UK increased bans on weapons in 1987, including not not limited to semi automatic rifles after the Hungerford massacre- a rampage of gun violence with a duration of 6 hours and a total of 16 deaths- and then took even stricter measures in response to a school shooting in Scotland in 1996. On June 12, 2016, the U.S. suffered its deadliest mass shooting at Pulse nightclub in Orlando with 49 deaths, and failed to pass lasting bans on semiautomatic assault weapons, handguns, military rifles, and other especially lethal guns. A startling question that arises…What is the U.S. waiting for? For a nation that prides itself on world leadership, the United States has an unfortunately slow reaction time to devastatingly preventable acts of gun violence as compared to its global counterparts. President Obama admitted that “We have a pattern, now, of mass shootings in this country that has no parallel anywhere else in the world,” after the shooting in San Bernadino, and the recurrence of gun violence demonstrates a nation unwilling to cease that atrocious pattern. Social issues such as gun violence must be met with political and legislative changes, an area in which the U.S. is pathetically lagging behind.